Three Strikes And It's Out! How I removed a medal embedded in acrylic. Recently I acquired a 1¼-inch bronze medal embedded in an acrylic disc 2½-inches in diameter by 1-inch thick. I had been looking for this medal for ten years and it filled in the final space in a 12 medal set. I did not, however, want it to be the only medal in the set in a 2½-inch lump. I consulted various sources and found Alan Weinberg's suggestion to freeze it and then hit it with a hammer. While the medal is rare it was not expensive at $6.51 on eBay. So I decided to give it a whack. As can be seen from the picture the medal was embedded off-center and slightly tilted inside the acrylic with a few air bubbles around it. I suspect this piece was a discard. The medal was struck in 1953 and is one of several Lucite encased medals I have from the 1050s. First: I reduced the size of the acrylic disc. A neighbor with a band saw cut off the excess bulk leaving me with roughly a 2-inch square cube 1-inch thick with a rounded top. Second: I popped the block into the family freezer. I allowed it to sit there for two weeks. I noticed over time the interior of the block slowly became slightly opaque. It not so much misted over as it misted within. Maybe this is a sign of the cold penetrating the plastic. I do not know but when the misting stopped after about 10 days, I started to look for a hammer. Third: I got my 14-oz. hammer, put on safety glasses and took the cube outside to a flat rock by the side of the house. I stood it up vertically, hit it smartly and a big lump flew off leaving one side of the medal exposed but it was mostly still embedded. I hit it again. This time more plastic shattered with shards going everywhere. 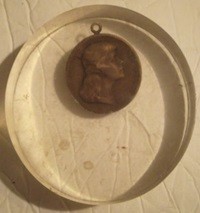 The medal was now ¾ of the way out of the plastic with a jagged lump remaining at the top of the medal. I laid it on its side, hit it again and the rest of the plastic was gone. I was not very precise with my hammer and the third strike was off point and added a small dent to the top of the medal and removed the loop. For me, even given the bit of damage I did to the medal, having it out of the plastic in one piece was a triumph. Aftermath: There were some small bits of plastic still adhering to the devices and lettering on the medal but a 24-hour bath in acetone (nail polish remover) turned those bits into little soft globs that could just be rolled off with a finger or picked off with a fingernail. Much like the glue that holds a new credit card to the mailer they send it in. The bonus was that the acetone did not change the finish on the medal. Having done this once, I am now sure I can do it in the future with much more precision and no damage at all to the medal. I just need to learn to keep my eyes open!.